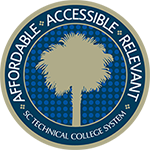 Annually, each of the sixteen technical colleges within the SC Technical College System (SCTCS) submit a comprehensive evaluation report on all associate degree, diploma, and certificate programs. This process, referred to as Program Evaluation, typically begins in March and ends in August of each year. Data collected during Program Evaluation are used to calculate and report graduate placement rates. Colleges provide data on the cohort of students who were conferred an award between July 1 and June 30 of the prior academic year. Awards include associate degrees, diplomas, or certificates. Responded = Graduate responded, but does not satisfy either the “On Job”, “In School,” or “Excluded” status. Excluded = Graduate should not be included in the placement rate because he/she is deceased, disabled, pregnant, incarcerated, or not actively seeking employment. Military = Graduate is actively serving in the US Military. On Job = Graduate is employed in a position related to his/her program of study. In School = Graduate continued his/her education beyond the technical college degree, diploma, or certificate received. No Response = Graduate did not respond to the survey. Direct questions about Program Evaluation to the SC Technical College System Academic and Student Affairs Division at (803) 896-5361.